Taman Ayun: Beauty in Serenity | What an Amazing World! It appears on many advertisements and campaigns, from tour companies to the national airline. It is comfortably located in central Bali, off the main road connecting Bali’s capital to the western port of Gilimanuk, and easily accessed by anyone who’s visiting Ubud. Yet, Taman Ayun remains a largely tranquil place that draws a moderate number of people to come and see its iconic meru (multi-tiered sanctums). Taman Ayun, built in 1634, was constructed as the mother temple for the Kingdom of Mengwi, one of many small kingdoms on the island. Historical accounts on the temple, however, are limited and most stories on Taman Ayun are based on the Babad Mengwi (Mengwi Chronicles) and folklores. By the late 19th century the kingdom fell and its area was divided and controlled by its neighboring, more powerful kingdoms. 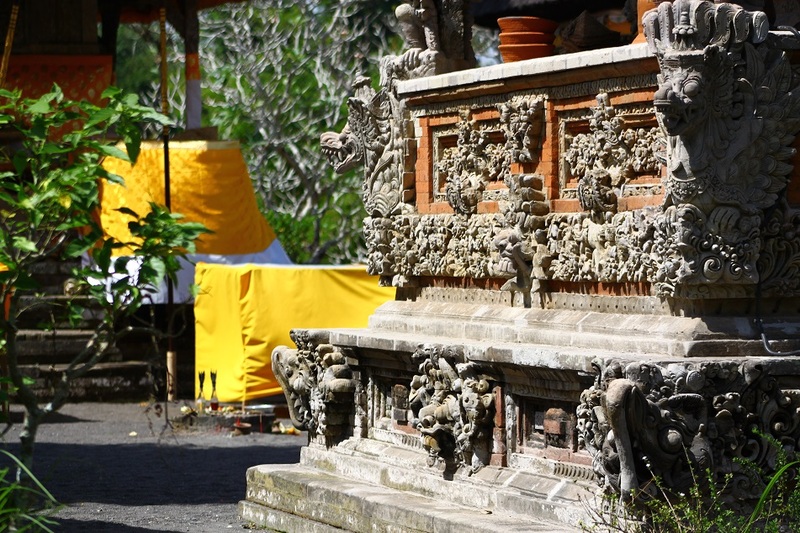 Mengwi’s most notable heritage, the temple of Taman Ayun itself, was later damaged by the 6.6 earthquake that struck Bali in 1917, the same earthquake that closed off the purported underground tunnel between Besakih and Goa Lawah in eastern part of the island. 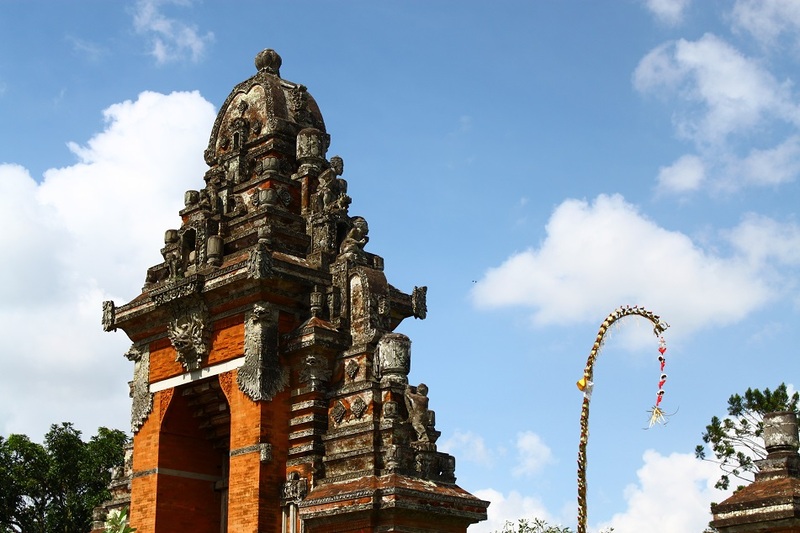 Major restoration work was conducted in 1937, and further in 1949 which focused on the temple’s kori agung (mountain-shaped gateway) and candi bentar (split gate). Its multiple meru have been restored to its former elegance with the tallest as high as eleven tiers. More than 2,000 Hindu temples were destroyed by the 1917 earthquake on the island, but Taman Ayun sees relatively better days today. 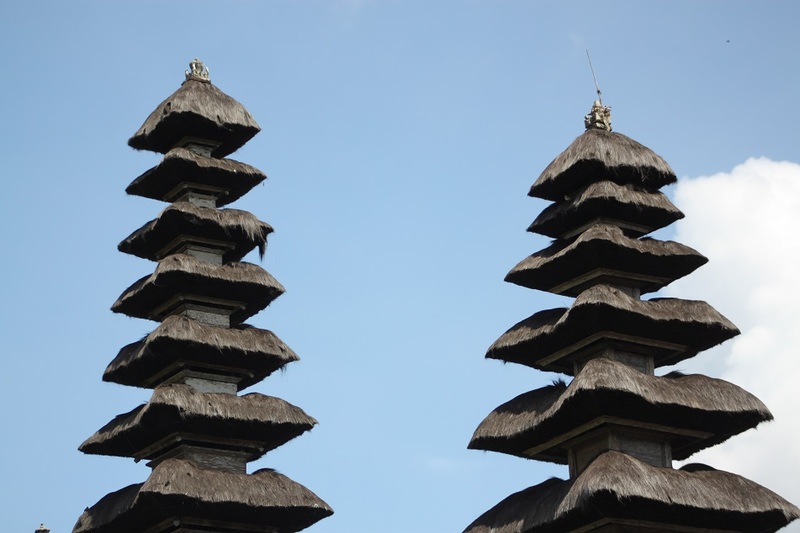 Despite its central location, tourism has not overrun the temple as it has on Pura Tanah Lot and Ulun Danu, chiefly during peak tourist season. 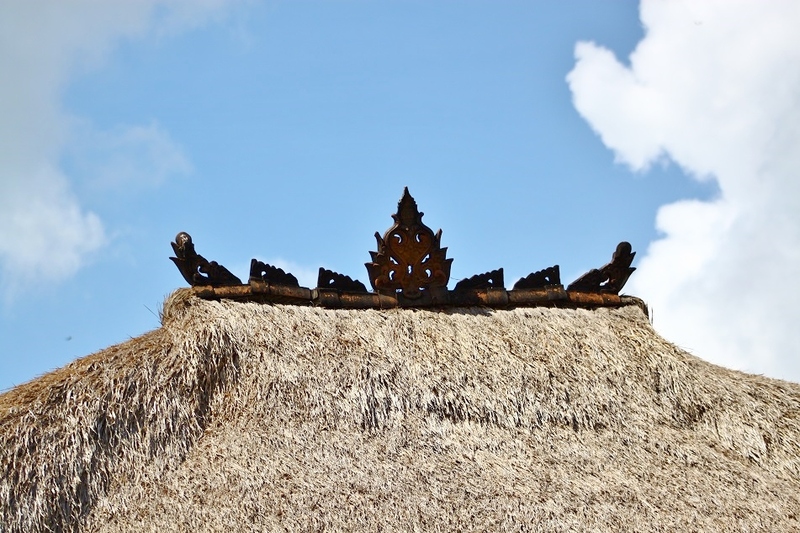 That and Taman Ayun’s location at one of the most prolific regions found on the island have assured UNESCO to grant the coveted World Heritage Status to Bali’s cultural landscape in 2012. Thank you for reading and leaving such a kind comment, Suhas. It’s always good to read a background of the place because it makes the reader appreciates the already beautiful photographs!. Bama, I’m glad to have come across your blog after some time. That’s exactly how I write my blog posts because long read can be boring without images, while images can mean nothing without story. Or at least that’s how I see it. So very glad you posted these. Reminds me of temples we saw in Nepal that are perhaps gone now after the earthquake. (I haven’t returned, so I don’t know.) The carvings and intricate designs are amazing! If I guess right the temple you mean is Nyatapola, which according to the sources I read it is still standing. I really like the carvings of Taman Ayun temple too. So beautiful! Sudah pernah ke Bali kah, Fauzi? Kalau belum jangan lupa untuk mengeksplor tempat-tempat di Timur, Utara, dan Barat Bali ya, karena kebanyakan wisatawan hanya mengenal Bali dari tempat-tempat wisata di Selatan. Hahah… sebenarnya pernah Bama, tapi cuma transit di Bandaranya doang, saat itu juga cuma dalam pesawat, malam hari, hujan dan saat itu saya lagi tidur… jadi anggap saja belum pernah 😄😄 .. , okelah , kalau dapat kesempatan ke Bali lagi pasti bakal dieksplor. Nah, apalagi kalau gak turun dari pesawat sama sekali. 🙂 So, kalau nanti ke Bali silakan dieksplor sepuasnya. You got some great detailed photos there Bama! Even though Ive visited, I wouldn’t have remembered such detail and intricacy! Taman Ayun is probably the number one temple/water palace in the Ubud region for me. Such tranquillity. Thank you, Lee. I took the photos on my second visit to Taman Ayun and the weather was perfect, as opposed to the very cloudy day on my first visit a few years ago. I quite like Taman Ayun too despite the relatively compact size of its main courtyard. Didn’t realise so much was destroyed in 1971 – Krakatoa I’m guessing. Amazing photos. Thank you, Mallee. It was actually a tectonic earthquake, not one caused by a volcanic eruption. Both are common in Indonesia, though, as the country sits on the Pacific Ring of Fire. The detail is amazing. I totally appreciate how so many cultures put so much time in to the tiny details. Thanks for sharing. Really beautiful! It’s one of the main reasons why I love exploring different cultures, because each has its distinctive mark on the local architecture, food, and customs. Very fascinating! Thank you for reading. Incredible looking place. I especially like your shot of the buildings covered with yellow fabric. Thank you, Marie. 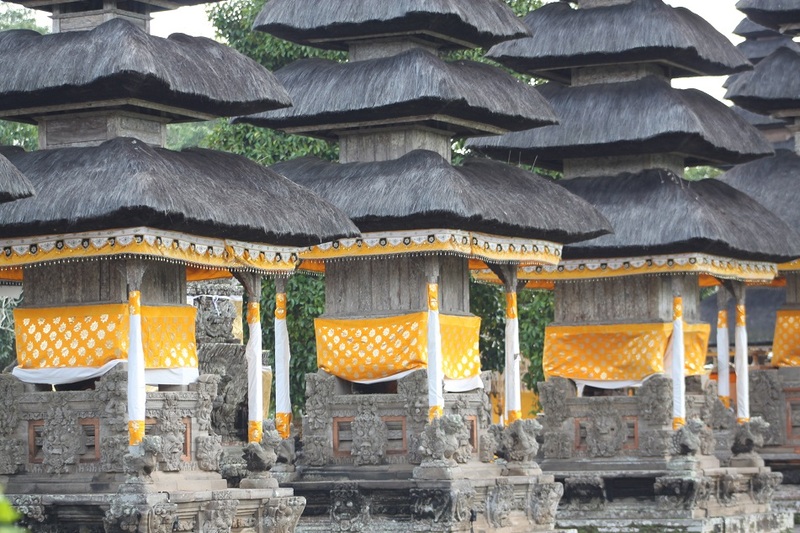 Being Bali, there are so many sacred buildings and trees on the island covered in Balinese traditional fabric. We’re in Sri Lanka now although this part of the trip didn’t start quite well as we were both a bit sick. But we’re fine now. Thank you again! Aaaahh, Sri Lanka! A huge favorite of mine. Jealous! Hope you’re having a great time in that beautiful country. It didn’t start really well, but I’m glad so far it gets better every day. This is my second time visiting the country, and I love it even more. 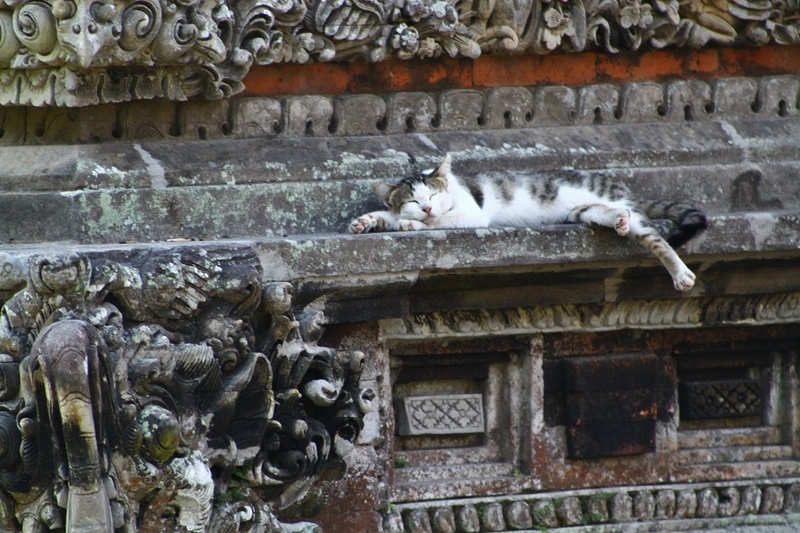 I’m going to visit the ancient city of Anuradhapura tomorrow and hopefully I’ll be able to explore some places I had to skip the last time I came. Thanks Kelly! And still the most iconic picture is the one with cat in frame 😁😁 Anyway, wonderful story, Bam! The visions of the carvers and the complexity of their artwork is truly incredible. I especially like the photo of the protruding spines. My driver told me that experienced carvers don’t always need a sketch to start their work — they simply follow their hands! 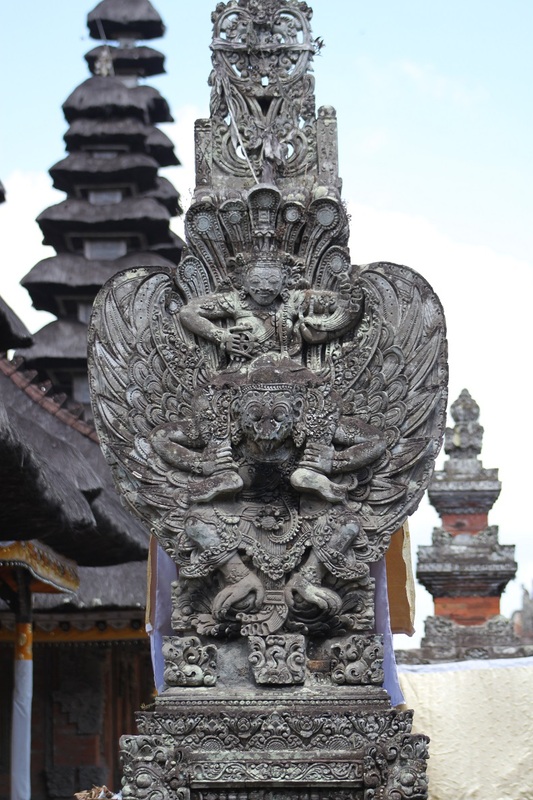 Balinese carvings are truly some of the most exquisite I’ve ever seen. Thanks Marilyn! A few years ago Taman Ayun was undergoing renovation, possibly around the time of your previous trip to Bali. But now you know what to see if you happen to be around that part of the island. Thanks for reading. That is some amazingly unique architecture! 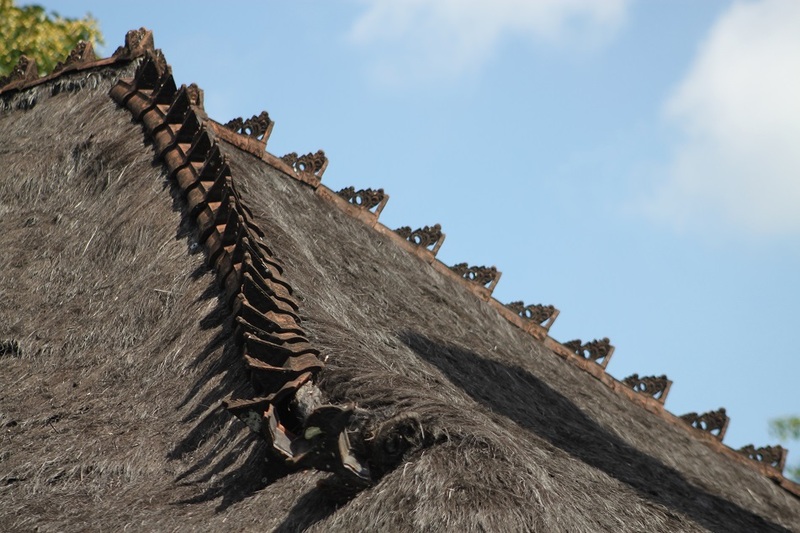 Your photos are excellent; I particularly loved the rooflines (and the spines – fascinating!). Thanks for sharing this interesting place with us. 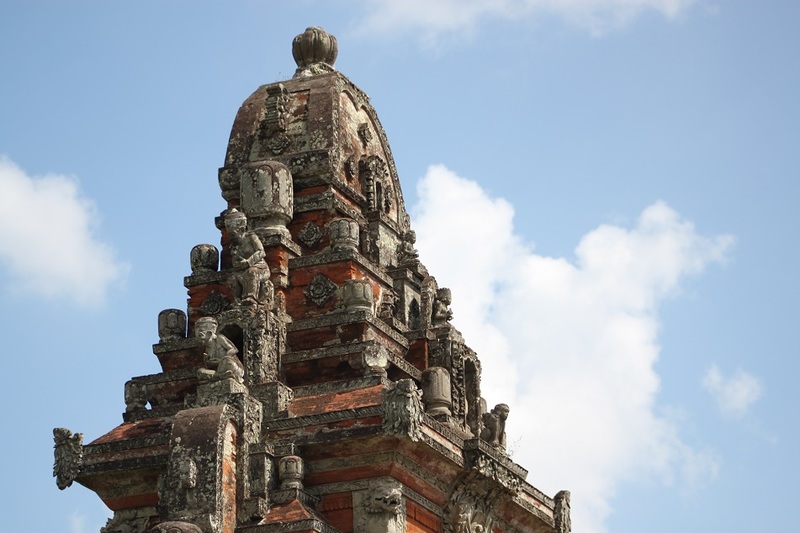 Some people keep returning to Bali for the beaches, but it’s the beautiful Balinese Hindu temples that keeps me coming back for more — apart from other aspects of the island’s rich cultural scenes. It’s my pleasure to share Taman Ayun with you. I’m glad you enjoyed it. Gorgeous Bama. Lovely to be reminded of Bali in this way. It’s such a unique and beautiful culture. Thank you, Alison. Despite the mass tourism in some parts of the island, it’s really commendable to see how the locals preserve their unique culture amidst ‘modernity’. I’ve always wanted to visit Malaysian Borneo for its wildlife, indigenous culture, and food. Do you live in Sarawak or Sabah? well, i am from Sabah. born and raised here. so, if you ever wanted to come here, do notify me (if you want a company thats it) =) i can be a good guide. Haha, no I actually come from Semarang in Central Java. But in 2008 I moved to Jakarta and now I’m traveling for six months. Unfortunately I have to skip Sabah this time. Hahaha, ini ada pecinta mpus juga. 🙂 I try to always take photos of cats wherever I go. Anyway, please do visit Taman Ayun the next time you go to Bali. It’s now part of the island’s first and only UNESCO World Heritage Site. Amazing photos Bama. As others have said the details you have shown leave me wondering about the carving. So intricate it is difficult to imagine how long such artwork would take to be created. Thank you, Sue. I believe it took weeks, if not months, to finish each section. Although I won’t be too surprised if they actually needed only a few days to carve such intricate details. Balinese are some of the most artistically talented people I’ve ever seen. Amazing Bama! Thanks for showing it to me. These are really some great shots of this piece of history ~ and as you say, I recognize it from ads I’ve seen. The photos you have are artful in the sense that not only are they beautiful, but they show the detail and passion of the people who created these places. Impressive in beauty and I imagine its serenity. Thank you very much, Randall. 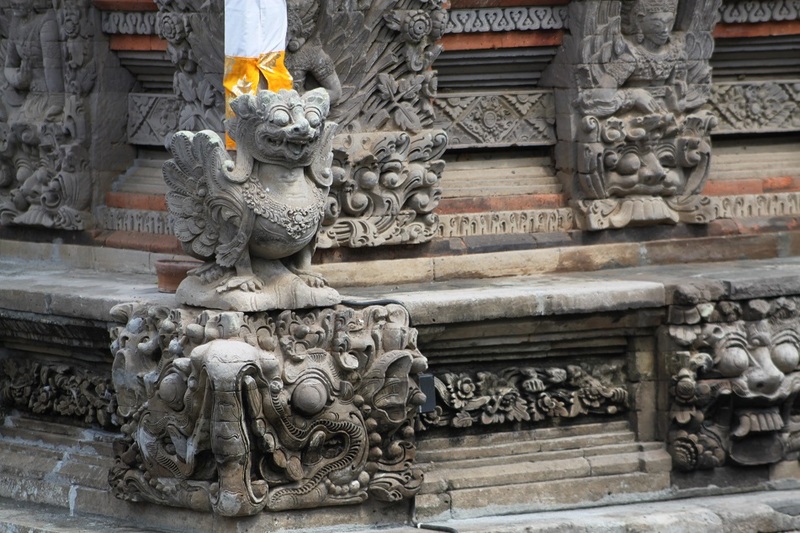 I’m glad the photos are able to show Balinese craftsmanship and passion towards art to the world. 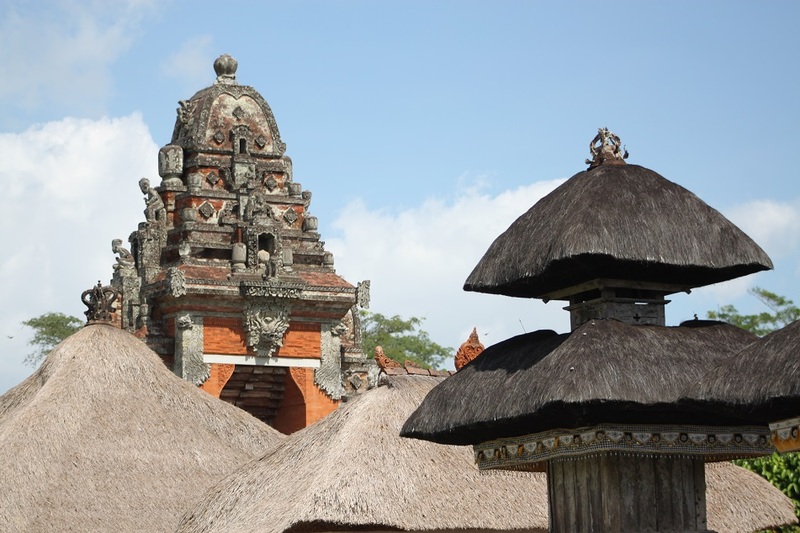 Despite its popularity Bali still is a wonderful place to visit with so many places to explore. Visiting intricate Hindu temples on the island is something I never get tired of. Thank you. I am in fact going to visit India next month, but I will focus on the south — Goa, Kerala, and Tamil Nadu. India is such a big country a single visit won’t certainly be enough. Seems to be an incredible place. Nice photo’s! A much peaceful place than Bali’s infamous Kuta and Seminyak for sure. Thank you and glad you enjoyed my photos. Incredibly blog and amazing photography! Your experiences are amazing! Wanted to let you know I nominated you for the One Lovely Blog Award. Hi Sam, thank you very much for your kind comment and nomination! I’m glad you enjoyed my blog. You’ve got a great photographic eye. I liked them all. The cat was a topper!! I love the photos and knowing the history makes it all the more interesting! Great post! Thank you. Learning the history of a place certainly makes the visit even more meaningful. That’s one of the reasons why I keep coming back to Bali. Their craftsmanship is really amazing! Amazing photos! Loving your blog.